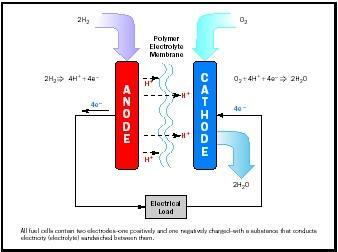 All fuel cells contain two electrodes—one positively and one negatively charged—with a substance that conducts electricity (electrolyte) sandwiched between them. If fuel cell know how can go beyond the storage question to one of containing the charge whole at the point of ignition. That would be the million dollar question and then some. Apparontly, the Swedes,Danes,Norwegian and German authorities have their navel assets use fuel cell know how when moving not only blue water capable units but heavy equipment as well. Since these countries have agreements regarding nuclear power, they have thrown that creative impulse to have R&D think up of ways to maximize not only diesel power, but fuel cell as well.